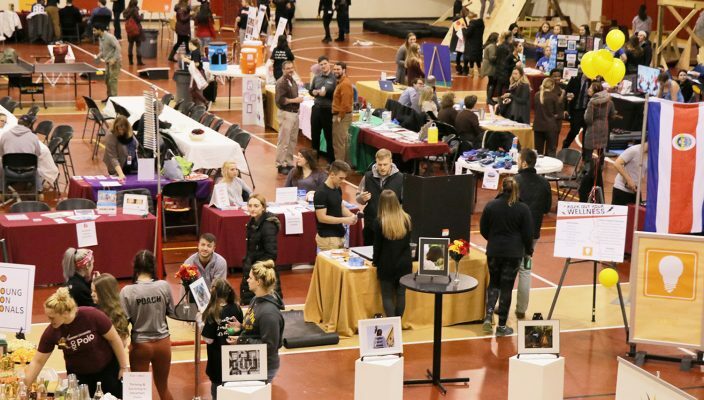 Gannon University’s 14th Annual Wellness Fair, the biggest event that the Recreation and Wellness Center (RWC) puts on each year, took place Tuesday. The event included a multitude of vendors from the Erie community and campus partners and had activities for everyone to enjoy. This year, Gannon’s Good for U wellness initiative has been working to make sure that everyone on campus and in the Erie community has the opportunity to explore their wellness journey and see what aspects of wellness that they connected with the most. Members of the community who attended the Wellness Fair interacted with each aspect of wellness and had an opportunity to learn how each fit into their daily lives. With attractions like aromatherapy in the emotional zone, active workstations in the occupational zone and an obstacle course in the physical zone, there was something for everyone at the Wellness Fair whether they were a student, staff or faculty member or member of the Erie community. To ensure that attendees could enjoy all the opportunities that the Wellness Fair had to offer, there were two waves: “Wellness at Work,” which hosted such vendors as Therapy Dogs United, LECOM Health and even campus partners such as the Student Government Association. The occupational therapy and physical therapy departments also had multiple locations covering the zones of wellness, such as activities to keep your mind sharp at the “Are You A Smarty Pants?” station. Mari Lohitai, a wellness department student aide, said she was happy to see the result of all the hours they put into this year’s Wellness Fair. Lunch was served midday with a selection of chili, corn bread, cookies, turkey, ham, chicken pesto and vegetable wraps for everyone. The Pep Band even gave an amazing performance later in the day during the second wave, just as dinner was being served. Around 4:30 p.m., there was a possibility that the Recreation and Wellness Center could lose power due to a campus-wide outage, but the fair continued and the staff and volunteers continued their work as they promoted wellness throughout the day. Fortunately, the RWC avoided any such power problems and the event continued without a hitch. “Happy Hour” provided dinner for everyone and included the largely popular obstacle course, located in the physical zone, as well as a station sponsored by the Erie Zoo, located the environmental zone. Many of the vendors had visitors coming back around for seconds. Many students could be seen throughout the day enjoying the event. Steven Pitcairn, a senior marketing management major, said that he had some free time and felt like the perfect way to spend it was at the Wellness Fair speaking to vendors about a variety of subjects related to wellness. Even though the largest wellness celebration of the year is over, Good for U will continue to support students, faculty and community members and help them fortify their own wellness journey. Keep updated on the latest from Recreation and Wellness Center by following the RWC on Twitter @GannonRWC, Facebook @GannonUniversityRWC and Instagram @gannon.rwc.